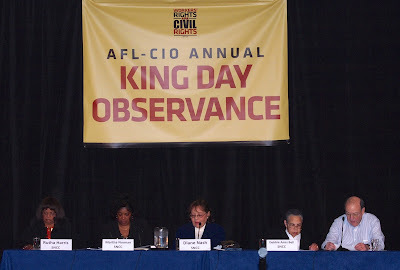 At the end of last month, I was finally able attend the AFL-CIO Civil Rights Department's annual Martin Luther King, Jr. holiday conference. I have wanted to participate for nearly 20 years. and all the pieces fell into place for this year's event. 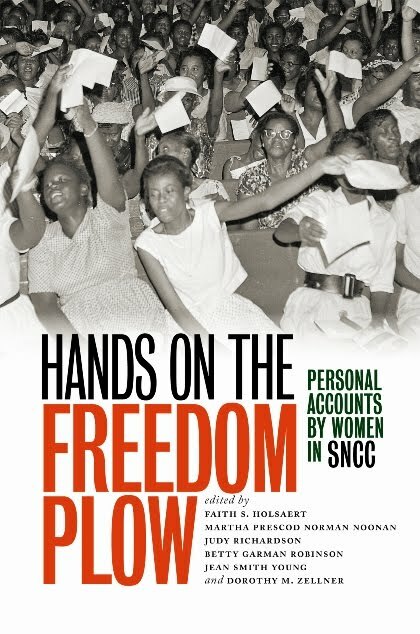 Besides the conference itself, a book I was introduced to there, Hands on the Freedom Plow: Personal Accounts by Women in SNCC, became the highlight of the weekend, and not just for me. 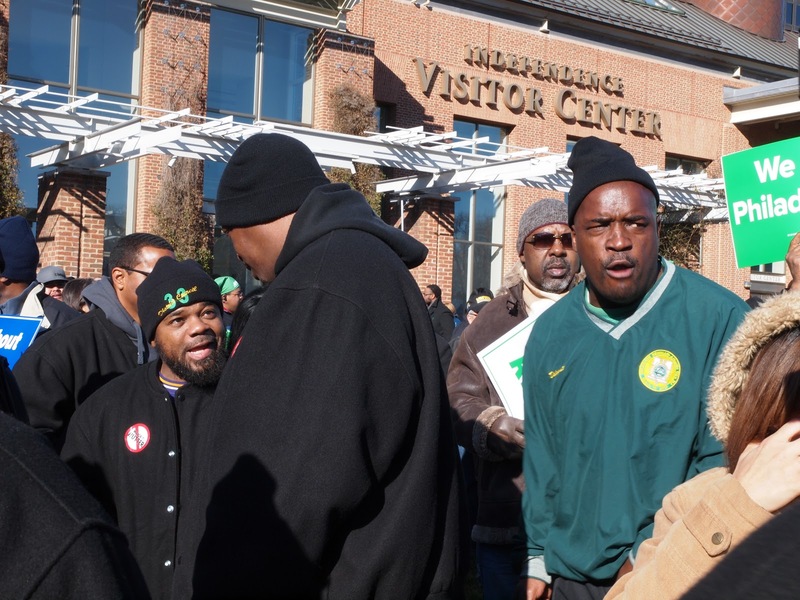 The US labor movement's true role in Dr. King's birthday becoming a national holiday is almost as forgotten as brother Martin's actual legacy. From the time of King's assassination in 1968, industrial unions, particularly the United Auto Workers, made the fight for the Reverend's birthday a major contract issue. For years, the Civil Rights Department's conference took place in Atlanta near the Martin Luther King, Jr. Center for Non-Violent Social Change. As the King family, and the King Center itself, became more interested in corporate sponsorships than actually serving the people, the annual conference moved to various other locations around the country where the community and the labor movement were engaged in struggle. city services, and demanding that public services such as education run on a for profit model. 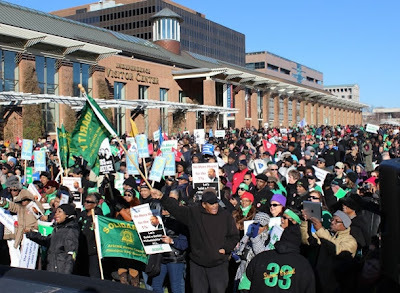 Our street activism in support of Philadelphia's firefighters, teachers, librarians, waste disposal workers and other municipal employees was very much in the tradition of Dr. King's support of the Memphis sanitation workers strike. Even more inspiring was the program introducing Hands on the Freedom Plow: Personal Accounts by Women in SNCC. Four of the 52 women who contributed essays about helping build the Student Nonviolent Coordinating Committee and contributed essays were present. Ms. Rutha Harris, Ms. Martha Noonan, Ms. Diane Nash, and Ms. Debbie Amis Bell, spoke about their experiences in SNCC, reading from the book while Ms. Harris sung freedom songs of the civil rights era. When I was [canvassing and] asking people, “Do you want to try to vote?” I knew I was really asking: are you ready to lose your job and go to jail? Oh and your house may be bombed and you may lose your life. And actually, some people said yes – some people earning $12 or less. Even some people living in homes covered with newspapers to keep out the cold. I think people were so used to living with fear and being aware that being black in America is so dangerous that it makes sense to risk everything and to move into an even more fearful place if there is even a small chance that freedom may be won. Particularly interesting were the impressions shared by retired Philadelphia school teacher Ms. Bell, whose contribution, entitled "A Young Communist Joins SNCC," comprised the bulk of her presentation. As a young activist in the 1950s, her relationship with both SNCC and the Communist Party's YCL were defined by the linked struggles around racism, jobs, peace, and healthcare. What made Debbie Amis Bell's inclusion in the program especially significant was her status as an open communist for more than 50 years. Since communist labor leaders were expelled from the CIO board during the McCarthy Era after WW2, the national labor movement has been very chary of acknowledging Reds in our ranks. This certainly wouldn't have kept her chapter out of a book published the University of Illinois Press, but her appearance on an official AFL-CIO Civil Rights Department panel reading about the influence of her CP membership in her organizing activities came as a breath of fresh air. Of the four photos in my friend Rah's latest Fire on the Mountain blog posting, two of them are shots I provided. Yes, I was also in Philadelphia for the AFL-CIO Civil Rights Department Conference. It was a great event and, while I may not alway's agree with Rah's vision of things, this FotM certainly caught the spirit of the conference. I'm merely writing in to share other photos from the five days in Philly with FotM readers. Click AFL_CIO Civil Rights conferenece photos to see more pictures. Let's Stop Inflating Crowd Counts, Eh? Poem of the Week: X.